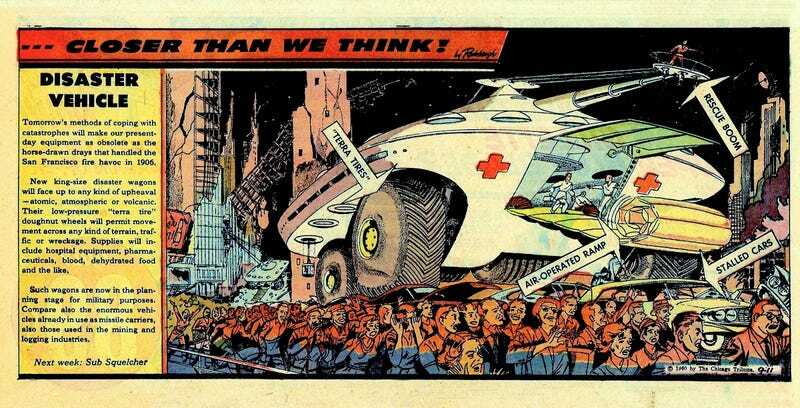 The September 11, 1960 edition of Arthur Radebaugh's Closer Than We Think envisioned a type of disaster response vehicle that could seemingly accomplish many of the things people still complain about whenever governments respond to crises. With a decimated infrastructure those "terra tires" (crushing cars, mind you) would certainly come in handy. It's interesting that the illustration gives no clue as to what horror these people must be running from; an uncharacteristically chilling image from pop-utopian Radebaugh. Tomorrow's methods of coping with catastrophes will make our present-day equipment as obsolete as the horse-drawn drays that handled the San Francisco fire havoc in 1906. New king-size disaster wagons will face up to any kind of upheaval — atomic, atmospheric or volcanic. Their low-pressure "terra tire" doughnut wheels will permit movement across any kind of terrain, traffic or wreckage. Supplies will include hospital equipment, pharmaceuticals, blood, dehydrated food and the like. Such wagons are now in the planning stage for military purposes. Compare also the enormous vehicles already in use as missile carriers, also those used in the mining and logging industries.